Adam Alexander tears down the male-dominated music industry with his music blog FRINGE MUSIC FIX and features artists fighting for social justice, LGBTQ+ and feminist causes. 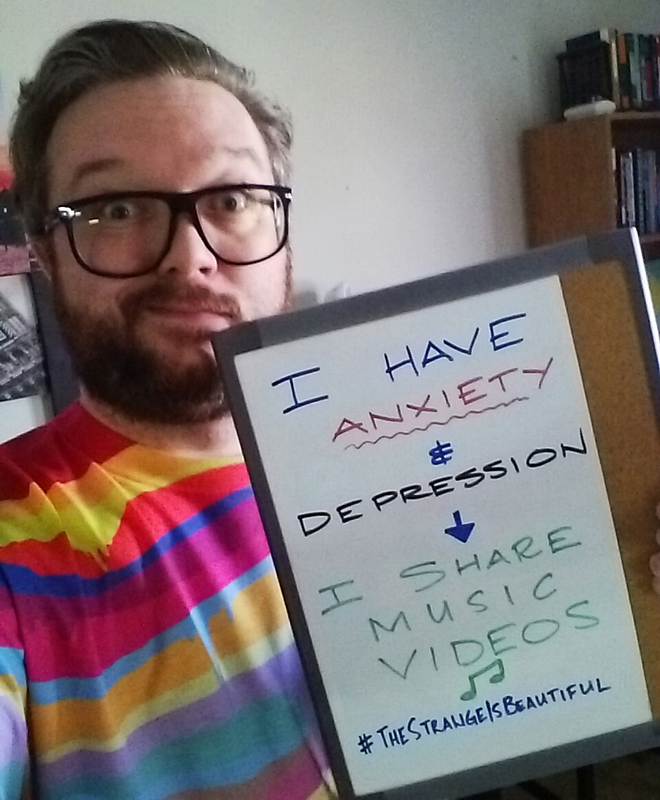 Learn about his anxiety, depression and phobias and his personal self-help routine. Well, my name is Adam and I’m a thirty seven year old INFJ Pisces who lives in a small town of 5k folks called Espanola, which can be found in Northern, Ontario, Canada (about 4 and a half hours from Toronto). I work as a data entry clerk by day, and I spend most of my free time watching tv and music videos. I also like listening to music, playing video games, and dreaming about all the cats I will one day call my family. I am the creator of my favourite blog called FRINGE MUSIC FIX. It’s an alt-pop and electronic music video focused blog I started around 2012 and that typically showcases female (including trans, gnc, woc, etc.) and LGBTQ+ artists, quite simply because these individuals create the majority of the music I love and connect with musically and emotionally…but also, because there is still not nearly enough representation or respect for these groups in music today. Take music festivals for example, still this year there have been festivals with very unbalanced lineups. For example the 2017 Read & Leeds lineup only includes one act with a female member, Against the Current. The Firefly festival in the US is also predominantly male this year. Tell me about your mind obstacles. I have been coping with anxiety and depression since adolescence. I guess, in the simplest terms, I worry, a lot, all the time actually. My anxiety is rooted in the fear of the occurrence of being subjected to physical or emotional harm. This has been the catalyst to a plethora of phobias including fears of heights, enclosed spaces, diseases, germs, etc. I have always had an irrational fear of death and/or the possibility of the end of the world. In an emotional sense, rejection and the loss of loved ones has always been something I find difficult to cope with as well. This can make it difficult to maintain friendships, relationships, and a closeness with family. The brunt of my depression relates to low self-esteem and insecurities. I often worry far too much about what others might think about me, which has hindered me emotionally, as well as creatively and productively my entire life. I remember when I was about 12, I began paying closer attention to the news, and I remember hearing about Desert Storm and the situation in Iraq and having a very real and powerful reaction to this. The news and the reality of possible international warfare terrified me relentlessly. I have a very visceral imagination which some might see as a virtue but has also been like a curse for me. I often imagine potential nightmare scenarios in great detail. Social anxiety has also been a recurring theme. As much as I love people, it can be a challenge and exhausting to interact with them, whether that is obvious or not to others. As far as my self-esteem and depression, it’s harder to pinpoint the start of that. Perhaps my inclination towards introversion has made it harder for me to make friends and connections with others, which has in essence distorted my ideas of how people feel about me. Through grade school and early high school, when I wasn’t being ignored, I was being teased and bullied. This was also a very strong factor in my compromised self-esteem. I have a very strong tendency to overthink everything to an obsessive degree, this makes my brain a tangled web. My natural perspective is to view life through a layer of pessimism, which has often made me feel confused, alone, angry, and misunderstood. When did you start to take action to feel better? I was in a long-term relationship with someone whose personality and outlook contrasted very strongly with my own. At some point during this time I realized that life would eventually present me with some less than desirable situations and I’d need coping tools and a much healthier outlook on life to get through them. I think I truly started wanting and realizing I could get better during this relationship and I learned a lot in the time we spent together. I was presented with many tools and resources like yoga, healthy diet, exercise, and most helpful of all, the idea of cognitive therapy. We bought a book together at one point called Mind Over Mood, which has become integral to balancing my irrational thoughts with optimism. I also very much enjoyed and found helpful ideas about empathy from The Art of Happiness by The Dalai Lama. My parents and sister have also been very supportive and all understand first-hand what it is like to struggle with mind obstacles. I have also found much solace in focusing my spare time on my passions, specifically music, tv, art, films, and my blog. Obstacles you face in your healing process? Situational circumstances can set me back. For example, last fall my anxiety levels increased due to the stresses of work and accepting too many side-projects and I ended up with shingles, at only 36 years old! My mental health is often very strongly linked to my physical health. I think if you can find a balance either in regards to physical or mental health, the condition of the other improves instantly. Goals for healing for 2017? I say this every year, so I guess my intentions are good, but more exercise and more junk-food moderation (I really love junk-food). I quit drinking last June to see if I could and that has become something I am very proud of. I also do not use drugs. The loss of control is not something I enjoy, so it seemed very logical to me at some point to not do things that may contribute to a less clear state of mind. Mine is already jumbled enough as it is! What is your self-help routine? ‘Routine’ being the keyword. I find sticking to a daily plan is very helpful for me in organizing my thoughts and emotions. That said, I try hard to make sure I have a defense mechanism in case I cannot conform to my plans on any given day. I am very committed to learning to love myself more, not something that comes naturally. I try to treat myself the way I would treat a significant other who I unconditionally care for. It’s a work in progress, but very important to me. I am always sure to set time aside for my hobbies and also for relaxation. It is vital that when I leave my day job, I leave it there, and visa versa, where my blog is concerned. While sometimes my inclination is to always spend time alone, I make a conscious effort to spend at least some time with friends and family and more importantly with people who make me feel loved and supported. I’ve met very few people raised as male and perceived as cis/het who are open to talking about their mind obstacles, in fact, 80% of my The Strange is Beautiful followers are women. Why do you think this is? I obsess over this idea. I was raised to believe that sharing emotions and thoughts and being open about mind obstacles is one of the best ways to feel better, regardless of a person’s gender identity. If I can encourage someone who wouldn’t otherwise open up just by sharing my own ideas, then as far as I’m concerned, it would be criminal not to share. The direct answer to your question is, I think men are less likely to share because of society’s stigmas surrounding mental illness, which seem even more prominent where males are concerned. While I feel that a male who is open about his mind obstacles is a actually a sign of strength and of courage, society tends to think the opposite, and these traits are seen as a sign of fragility and weakness. I subscribe to the theory that many of the issues that we see in society, ranging from violent crime, to sexual assault, can be traced back to not only long histories of abuse, but if we dig deeper, the shaming and repression of men’s most vulnerable thoughts and emotions. What has been your personal experience being raised as a male with mind obstacles? Have you faced any stigma? I have definitely faced stigma and have been at the receiving end of many homophobic and misogynistic slurs. I suspect my obvious sensitivity and eccentricity as a child and teen made me a target for these comments. As a teen I shut down completely and basically cut off as much social interaction as I could. My mom’s support through that time when I would permit it helped me to realize that I was mistreated because my openness, demeanor, and idiosyncrasies, scared and confused others. I have seen so many guys struggle through life with all of their bottled up feelings and I think it is a shame that we feel we must adhere to gender norms in such a rigid manner. Much of the best support and encouragement I have received has been from females, but there have often been times I wished I could find males who would be open to sharing as well. What health services – Eastern or Western medicine or holistic practices – are available and affordable to you in Ontario? To be honest, I have not done enough in the way of exploring these resources. I have seen my family doctor and a Councillor for guidance, but I did not click with these individuals and my take-away was mediocre to say the least. In my darkest times, I have found the assistance available for mental health in Ontario much too complicated and frustrating. I have had more luck with online resources and literature than anything locally available. Check out Adam’s music blog FRINGE MUSIC FIX here and follow his Twitter here. Me & My Story is a space for you to talk about your mind obstacles and healing process. Email strangeisbeauty@gmail.com if you’d like to share your story.